Could John Axford break the MLB record for most losses by a reliever? Sports Stats ‘on Tapp’ is a sports statistics blog written with a focus on stats that go beyond the numbers. It’s time again to rag on John Axford. The much-maligned Brewers reliever had gone through a stretch where he was pitching well as a set-up man. Unfortunately, Wednesday’s melt-down and subsequent loss to the Pirates after the Brewers had a 4-2 lead in the seventh inning has put Axford back in the spotlight for his part in the loss (a loss credited to his stat line). Axford has three losses in the Brewers first 26 games. If we stretch that out over the 162-game MLB schedule, that would mean Axford is currently on a pace to lose between 18 and 19 games. The possibility of that happening is highly unlikely. But let’s stay with that premise for a minute. If Axford were to lose 18 games in relief, he would break the ML record. Back in 1969, reliever Gene Garber of the Atlanta Braves had 25 saves; he also that season lost 16 games in relief. Here’s a look at the pitchers who have lost the most games as a relief pitcher in a season. Last season two pitchers lost 10 games each in relief. Chicago White Sox reliever Matt Thornton had 10 losses as did Oakland pitcher Fernando Rodriguez. Through games of April 30 this year, there were four pitchers with three losses in relief, putting them on a pace similar to Axford. The four: J.J. Hoover Cincinnati), Phil Coke (Detroit), Steve Cishek (Miami) and Phillippe Aumont (Philadelphia). 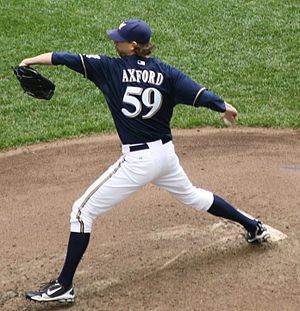 Axford in 2011 had eight losses out of the Brewers bullpen. That, however, was not a team record. In 1971, reliever Ken Sanders, “The Bulldog,” lost 12 games as a reliever for Milwaukee. In 1974, reliever Tom Murphy lost 10 games out of the Brewers bullpen, ranking his second on that list. What about the highest ERA by a Relief Pitcher? BTW I am a 46-year Cardinal fan. I have a question I cannot seem to find an answer to. My buddies and I are wondering what pitcher(s) have had the historically worst post season ever, in terms of losses and ERA?